The job role of a Barista involves serving hot, non-alcoholic drinks, and can be based within a variety of locations, such as public houses, cafes, coffee shops, restaurants, hotels and canteens. The role does not require qualifications, however the suitable candidate for the role must be able to deliver friendly, efficient customer service in order to create a warm and welcoming atmosphere for customers. The application process is usually the submission of an application form and cover letter to the recruitment department. Many job vacancies will be advertised on company websites, posters within the establishments, within local newspapers and on jobsites such as jobcentre advertisements. Sending speculative cover letters is also a good way of applying for this type of employment. This will then be followed by an interview, and possibly a trial to see if the role is suitable to you. 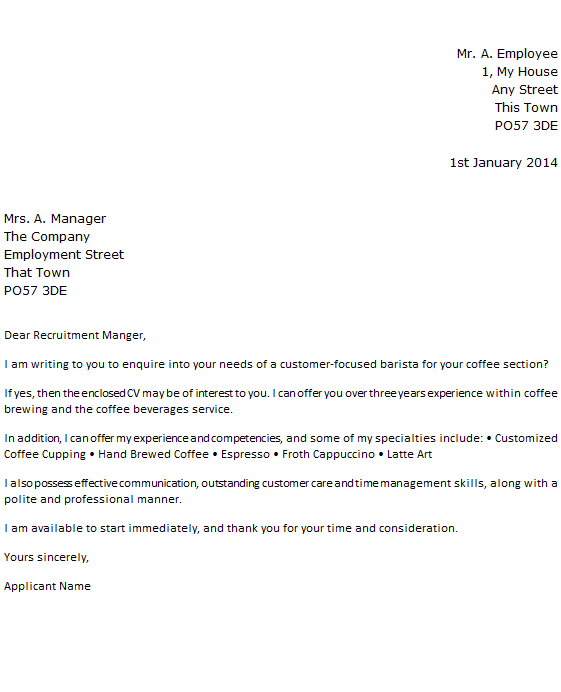 I am writing to you to enquire into your needs of a customer-focused barista for your coffee section? If yes, then the enclosed CV may be of interest to you. I can offer you over three years experience within coffee brewing and the coffee beverages service. In addition, I can offer my experience and competencies, and some of my specialities include: • Customised Coffee Cupping • Hand Brewed Coffee • Espresso • Froth Cappuccino • Latte Art. I also possess effective communication, outstanding customer care and time management skills, along with a polite and professional manner. I am available to start immediately, and thank you for your time and consideration.